Why pack up your off-season clothing and “stuff” when you can hang everything, wrinkle free, and ready to go! 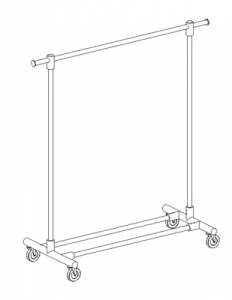 Garment Racks by Space Age Shelving are 60” wide, made of heavy duty 1-1/4” chrome, and are guaranteed never to bend, warp or rust. They’re great for entertaining too!